There are things that go bump in the night, and, then again, there are things that go bump in our psyches and rattle around with such fury that they can’t be quelled by any night light. 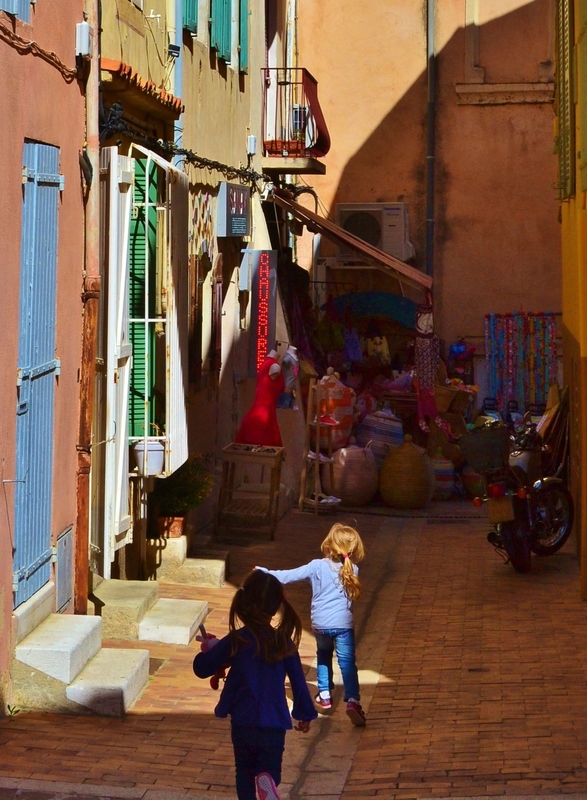 In fact, at some point and in the full light of day, they will trip from our tongues or scurry across the pages of our books—out into the world, across eras, and even across cultures. These monsters may prove themselves useful to us, even noble at times—our defenders from the monsters that show up at our doors in human flesh– but they are problematic nonetheless. They are never really controllable. Long before Prague was Prague, “the Golem” began rattling around our psyches as a shadowy form in Hebrew lore. The word references an unshaped form, or possibly an unrefined person—someone who is clumsy. A clod. Yes, a clod of dirt and dust . . . like Adam before Eden. But without the divine breath, the breath of life. So, how did this golem come to be animated? Scholars can point to moments in the Talmud or the Hebrew Book of Formation when a golem was brought to life by use of a shem—a name of God. If one of the names of God was inscribed on paper and placed in the mouth of the mud man, or perhaps inscribed upon its forehead, then the golem became animated. And so, tales of the golem took foot like so many clay men, trodding the shadows but living beyond a world they could understand or be understood in. Glimpses were reported in tales from Poland, Russia, Germany (at the hands of Jakob Grimm), and Prague. Prague. There was a city ripe for things that go bump and holy incantations both. 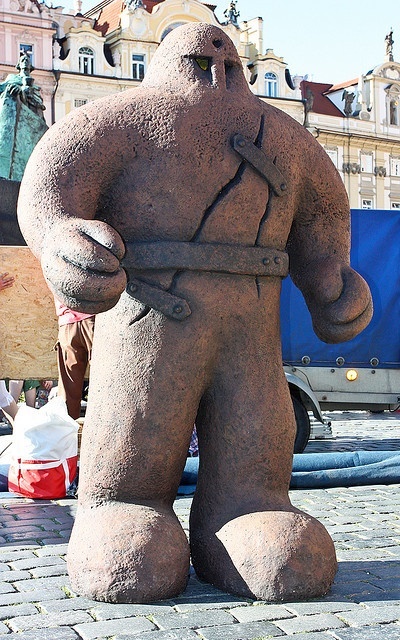 In 16th century Prague, these elements mixed to create a famous tale in which the golem was a being animated to protect the Jewish ghetto from oppressors. 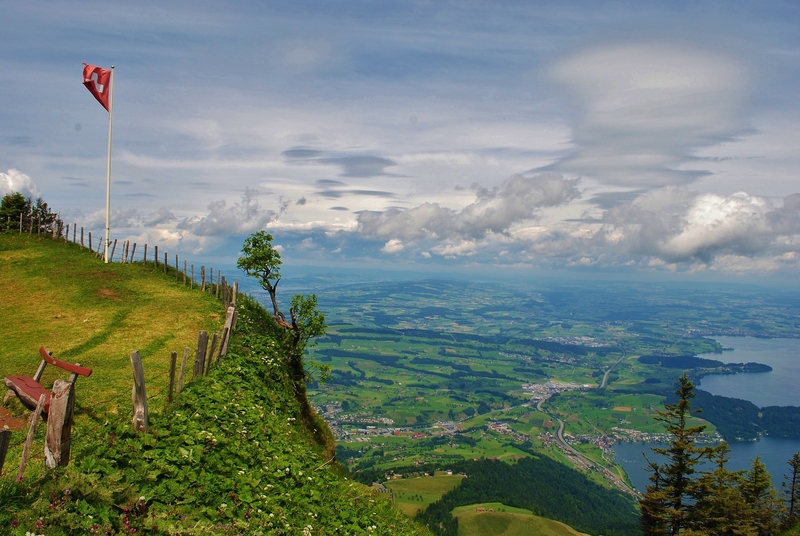 Although tales of the golem had been around centuries before, this famous tale of the golem was created by Rabbi Yehudah Levi ben Betzalel (aka, Rabbi Loew) . 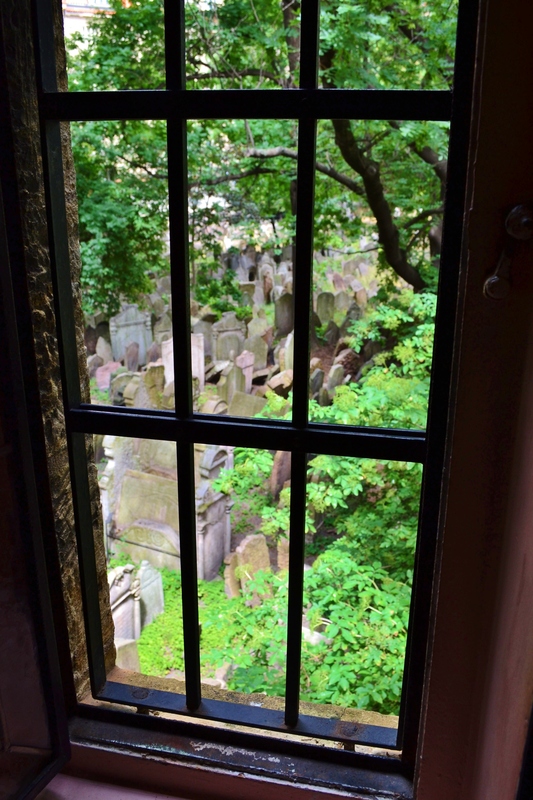 Rabbi Loew had his reasons: anti-Semitic attacks were a fact of life, and rumors abounded that a local priest was about to launch a new accusation at the Jewish community in Prague. They were to be wrongly accused of ritual murder of Christian children. To avert this disastrous situation, Rabbi Loew formed his golem from the mud of the Vltava River and, in a god-like act, placed life into its mouth with the Shem Hameforash. The golem was named Joseph, and he served as the protector of the Jewish Quarter. He was a hero, but he was also a monster–human-like, but not human. Created from the machinations of a man who, though holy, was less than God. And what happens when man meddles with the power of God? The story always turns dark. The golem grew stronger and stronger as time passed, and more violent too. He couldn’t be controlled. And so, the shem had to be removed from his mouth and the noble monster had to be “decommissioned.” The clay figure was locked away in the attic. If you are starting to think that Mary Shelley’s Frankenstein’s monster has eerie undertones of the golem, then I agree 100%. Sure, Rabbi Loew had more noble intentions than Dr. Frankenstein, but nobody ever really controls these monsters once they come to life. And no one really understands them, either. There is something poignant and lonely about these beings–despite the danger and the grotesque qualities they possess, they are almost us. Oddly, they are better than us in moments–they have the physical power to protect and they have remarkable innocence despite their power. Until the story turns. But it turns, at least in part, because of the violent world they must confront. And, having trod through the ages– from hints in the Garden of Eden, to full power in 16th century Prague, to the quintessential monster of British horror tales–the golem now prowls the streets of modern America in our dime store comics. Remember The Thing? He was a rock-man. The character’s real name was Benjamin Jakob Grimm (hello! ), and he was a Jewish New Yorker. 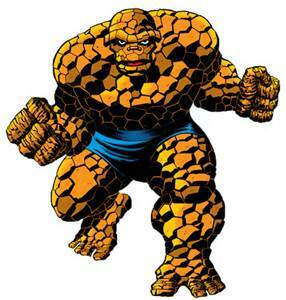 Ben Grimm was a test pilot turned astronaut who was transformed by cosmic radiation. Bummer. Of course, he’s a good guy (like the golem Joseph), but he does have a temper (like Joseph). Uncontrollable? Not necessarily, but the golem influence is undeniably strong here. In fact, there is apparently even one story line in which Benjamin Grimm reanimates the dead body of an innocent neighbor by reciting a Shem or a Jewish prayer. 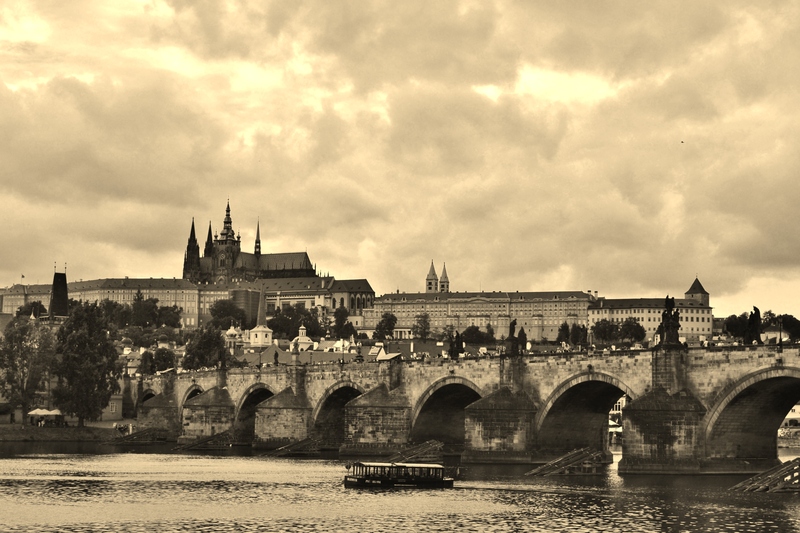 Prague claims the golem as one of its famous tales, and it should–that history is rich and deep. But we all know that the golem didn’t stay locked in that attic in Prague. No, it’s afoot and will always be. Told and retold, as long as there is mud and there are meddlers. 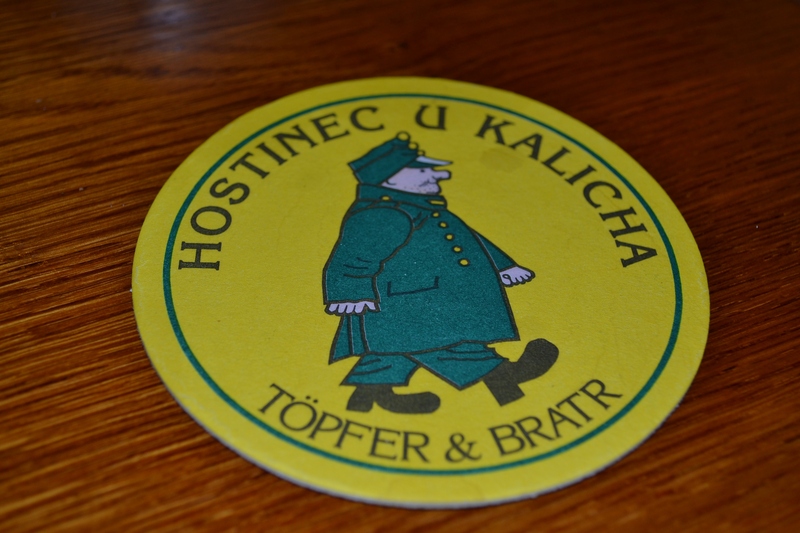 Our first night in Prague began with a fabulous dinner at Hostinec U Kalicha: “The Chalice Inn.” The restaurant had been recommended by the bartender at our hotel, and we arrived later at night on Monday night. (My camera stamp says it was Sunday night, but I could have sworn it was Monday–you know, travel time exists in a fuzzy space–who can say exactly what day it was?) Anyhoo, the restaurant was busy enough to feel welcoming and cozy, but not too busy to be very relaxing. 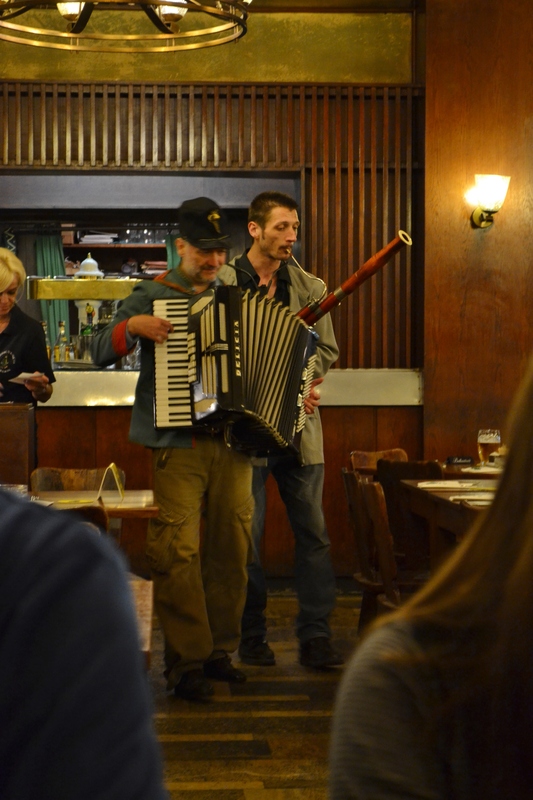 It had the atmosphere of an old European beer hall, in the best possible way. 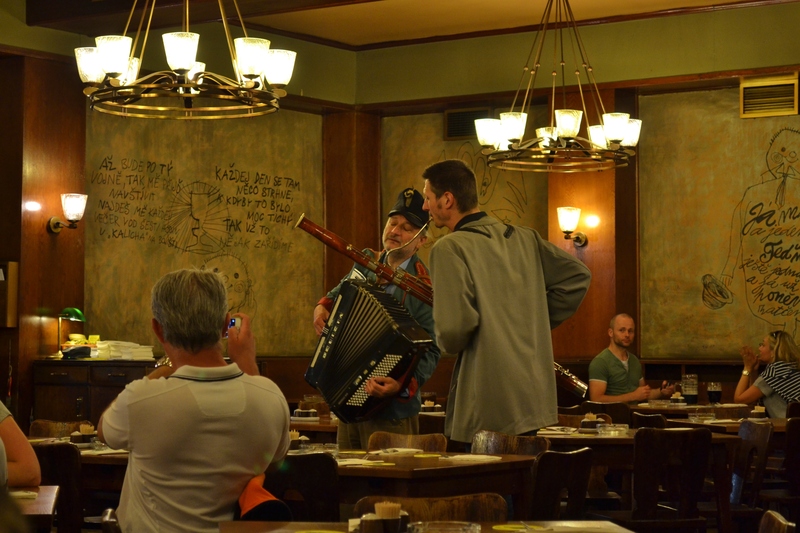 Not long after we sat down, we had our first taste of the wandering accordion player and bassoonist. They would come through and play a song, then disappear back into the kitchen for a while, only to reappear in fifteen minutes or so and offer another song. (Perhaps they were also our chefs–running back to cook between songs? Perhaps they were just enjoying a tall Czech Pilsner between sets?) They were very good and added so much atmosphere to the dinner. 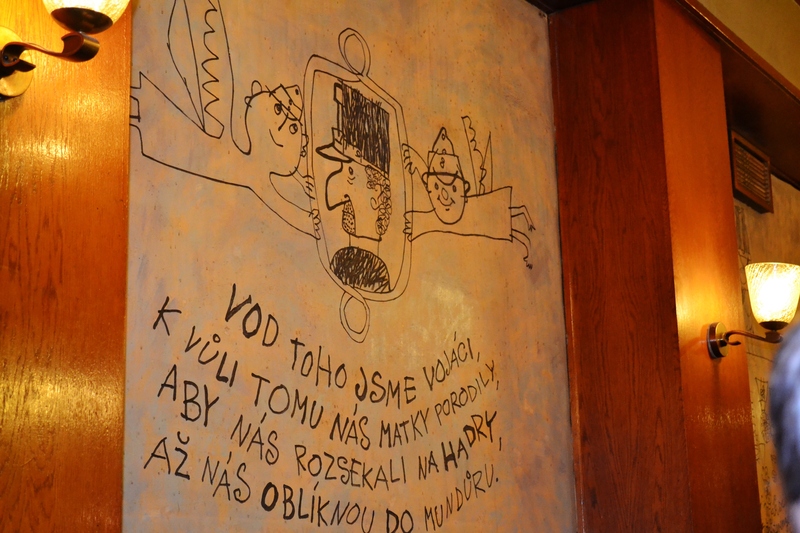 Another nice touch–the folksy art drawn on the walls. 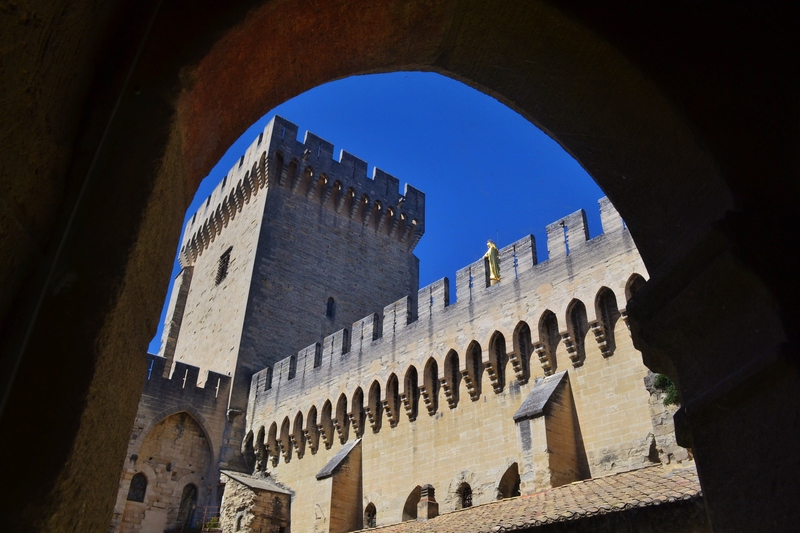 It relates to Svejk stories–soldier stories to come out of the First World War. 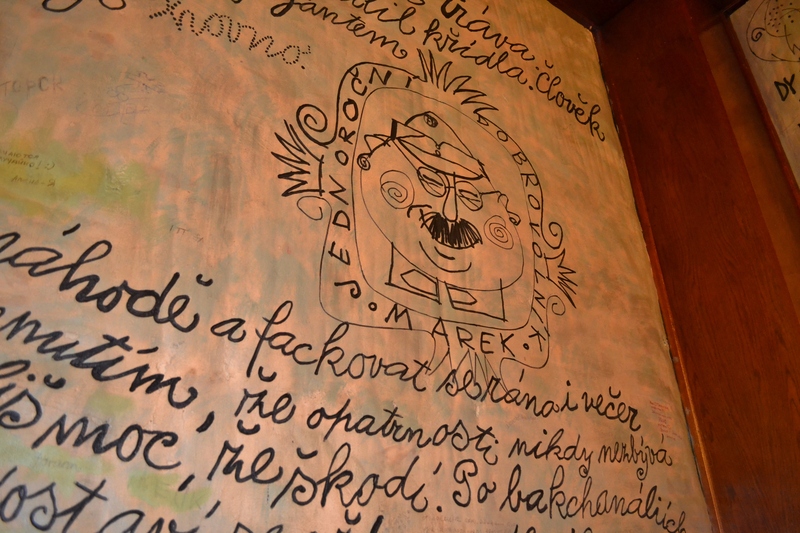 The owner was friendly and eager to talk to us about Czech food. Our waitress was a bit harried, but all was forgiven when she brought us the most delicious plates of food. What did everyone else order? Who knows! I was so enamoured of my dinner that everything else after that plate arrived is a blur. I had goose leg, dumplings, and cabbage–a perfect, crispy gooseleg, bread dumplings that are a Czech specialty, and cabbage that was fantastically tangy and sweet all at once. So, the only thing I forgot to get a photo of? The gooseleg, dumplings, and cabbage! And there’s the testament to a good meal: you don’t think about taking photos of it, you don’t ruminate on blogposts to come, you just inhabit the moment. It was a very fine moment.